Or the Long Journey to a NATO Space Policy? The Space domain is increasingly congested, contested and competitive and NATO is now, more than ever, dependent on Space. When discussing the Space domain, NATO is focusing on protecting access to Space as one of the global commons and on Space support to NATO Operations. In 2008, the Joint Air Power Competence Centre (JAPCC) published a study entitled – ‘NATO Space Operations Assessment’ (NSOA). This study identified 19 Space-related gaps and provided 23 recommendations to NATO. Among a few others, NATO’s lack of Space-related guidance is a recurring theme throughout the document. In 2012, ‘Schriever Wargame 2012 International’ emulated a notional NATO operation with reliance on space-based capabilities provided by nine NATO nations and Australia. The results provided a meaningful example of Space-related threats and challenges for NATO-led operations in the Twenty-first century. The Supreme Allied Commander Transformation (SACT) report on NATO’s participation highlighted once again the fact of missing political guidance. Unfortunately, two years later, NATO still lacks formal political guidance. In 2011, SACT founded the NATO Space Integrated Project Team (IPT), which started to work on some of the issues addressed in the NSOA and lessons learned during International Security Assistance Force (ISAF) operations. Even in the early stages of work, the group was advised not to work on a Space Policy due to ­political / national sensitivities, e.g. national sovereignty, or the need to safeguard strategic economic and industrial interests. Based on NATO’s participation at the ‘Schriever Wargame 2012 International’ and the shortfalls identified during that exercise, a NATO Bi-Strategic Space Working Group (NBiSCSWG) succeeded the IPT and was tasked by the NATO Military Committee (MC) to investigate specific Space-related questions. And again, a Space Policy was explicitly excluded from the programme of work. Within the last two years, the NBiSCSWG has made some significant steps towards improving Space support to NATO operations. Nevertheless, by trying to answer some of the questions addressed by the Military Committee (MC), and by looking over the horizon, the group has encountered boundaries due to the political and national sensitivities. At the moment, the NBiSCSWG is standing at a crossroads, unable to deter­mine the correct heading for Space in NATO. In fact, the group is currently not able to fully answer the questions posed by the MC due in part to a lack of political guidance about Space in NATO. An elaborate answer to the ‘why’ question was developed in the JAPCC publication ‘Filling the Vacuum – A Framework for a NATO Space Policy’, which strongly underlined the need for a NATO Space Policy. Examining NATO’s policy on Cyber Defence may provide a framework which can be adapted for the Space domain. A new NATO Policy on ‘Defending Access to Space’ provides a solid foundation from which Allies can take work forward on ‘Space Support to NATO Oper­ations’. The document would clarify both NATO’s priorities and NATO’s efforts in ‘Space Support to NATO Operations’ – including how to protect the Space capabilities that are used and the way this can be achieved. WHY a NATO Cyber Policy? WHAT is NATO’s Role in cyber defence? HOW will NATO respond in the event of a cyber-attack on NATO or the Allies? In awareness of NATO’s identified Space shortfalls and from a generic perspective, NATO’s Cyber Defence Policy is an example of a document that proves political sensitivities can be overcome and solutions to complex multinational challenges are possible. It also provides an example structure that could be adapted. NATO did not discuss Space issues at the latest summit in Wales. Based on the identified Space dependencies, shortfalls and gaps, including the most recent studies by the NBiSCSWG, NATO has sufficient evidence available to start working on all the existing recommendations and to assign higher priority to the Space domain. As a first step, NATO nations need to formulate their vision and strategy on how NATO should proceed to cope with those threats that are associated with the increased Space dependency. How could NATO respond in the event of an attack on NATO or the Allies Space capabilities? Any collective defence response by NATO will be subject to political decisions of the North Atlantic Council. NATO does not pre-plan any response option and therefore maintains flexibility in deciding a course of action. At the same time, the Space topic needs to be raised to the NAC so it can be discussed at the political level. At the next NATO Summit, the Space question should be included and, like Cyber was, delegated to the NAC to develop a NATO vision, strategy and policy on Space. This should also include an action plan that ­allows NATO to develop and establish the right mechanisms to cope with the challenges that are associated with NATO’s dependency on the Space domain. Secondly, NATO should allow its NBiSCSWG to continue its work beyond 2015. But this requires the NBiSCSWG to look outside the limited scope of the mandate and to discuss all aspects of Space Oper­ations. These conditions need to be provided by the NATO MC and would pave the way towards the development of a Space Policy for NATO. a Strategy for how NATO will achieve the Vision within the Policy framework. In order to improve NATO’s ability to exploit the Space domain, the NAC should set the conditions by promulgating political guidance for the development of a NATO Space vision, policy, and strategy. The content and roadmap of the existing NATO Policy on Cyber Defence could be used as a blueprint to draft NATO’s policy on Space. Such a policy would provide essential guidance to NATO operators while preserving national priorities and equities. The main focus of a NATO Space Policy should be ‘Defending Access to Space’, i.e. on the protection of NATO – used Space capabilities and on Space Support to NATO Operations related to national support that NATO relies upon to carry out its core tasks: ­Collective Defence, Crisis Management and Cooper­ative Security. Multi National Experiment 7 – Protecting Access to Space, available from https://www.gov.uk/government/publications/protecting-access-to-space. The JAPCC – NATO Space Operations Assessment, Revised Jan. 2009. NATO SACT – Schriever Wargame 2012 International HQ SACT Report, 2012. The JAPCC – ‘Filling the Vacuum – A Framework for a NATO Space Policy’, p.1 ff. NATO – Cyber defence, available from http://www.nato.int/cps/en/natohq/topics_78170.htm. 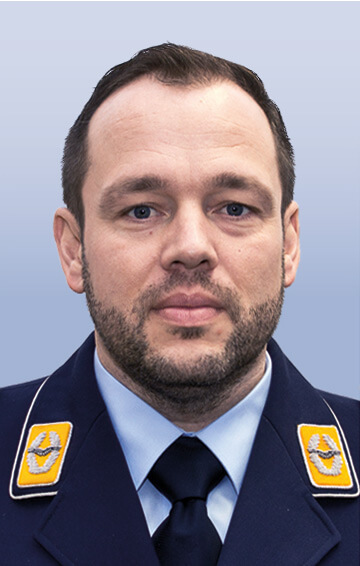 serves as a Staff Officer in the Operations Branch of the German Space Situational Awareness Centre. He joined the German Air Force in 1996 and holds two Master Degrees in Aerospace Engineering and Business Administration / Project Management. His officer career includes tours of duty as Tactical Control Officer HAWK, Reconnaissance Officer PATRIOT and Conventional Arms Control Officer. He has more than 10 years’ experience in GBAD Command & Control and Operational Planning, including tours as company commander of a GBAD Maintenance / Supply Squadron and a PATRIOT Squadron. From 2012 to 2014, Lieutenant Colonel Neumann served as a Space SME at the Joint Air Power Competence Centre. He participated in the NATO ISAF mission as an Army Task Force Air Liaison Officer in 2010 / 11.